— This is one licensed product that doesn’t miss a beat going from comic book to collectible-action figure. Sleek and elegant figures, beautifully hand-painted faces, articulated joints for movement and posing, outfits that capture the superhero(ine) spirit, and shiny, artfully styled hair are some of the reasons Tonner’s DC STARS™ dolls earned a TDmonthly Top Toy 2007 award. Plus, even a guy in the office couldn’t resist posing Bat Girl a few times. This card set includes four fun games and allows players to learn in English and Spanish. Kids can discover 36 reptiles and amphibians, by collecting frogs, snakes, crocodilians and more. Fabulous photos capture the spirit and personality of each animal. This product received a Spring 2007 Parents' Choice Approved Award. Launch date: February 2007. The 2007 Learning Calendar by FAT BRAIN TOY CO.
History becomes real with this calendar that features fantastic photography, detailed maps, accurate text and endless creative teaching ideas. The calendar helps individuals of all ages learn something new, build stronger relationships and get organized. It includes special references to the selected topics for 2007, First Ladies and International Landmarks. “The calendar data provides perfect prompts for classroom discussion, homeschool lesson ideas and family time conversation. The corresponding monthly newsletter and available online information bring learning to life with printable worksheets and activities,” Shannon Wallingford of Fat Brain Toy Co. told TDmonthly. This product received a Spring 2007 Seal of Approval from The National Parenting Center. Launch date: September 1, 2006. With this Award winning fun and educational game, families can learn facts about the great outdoors. For two to eight players, it includes 200 game cards and is designed to grow with the player, starting with level one questions (primarily animal identification) and progressing to higher level questions. “A vibrant earthtone color palette, full-color photos, interesting playing characters and a cute Camp card decoder” were incorporated to make this family game appealing to both children and adults, Jesse DenHerder, in graphic design/marketing for Education Outdoors, told TDmonthly. 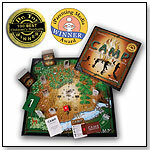 “With a game that is true to its vision in content and overall aesthetic, Camp will be a must-have for specialty retailers.” This product is 2007 iParenting Media award and 2007 Dr. Toy 100 Best Products Award winner. Launch date: December 15, 2006. This soft, cushy cover makes bath time easier and safer, and allows parents to actually see the water temperature. The color-changing backlit display has a Comfort Zone indicator, audible high-temperature alerts, and an ON button with auto shut-off. Blue means too cold, red means too hot and green means just right. The mildew-resistant product is easy to install and clean. According to Lisa Orman of KidStuff PR, “It’s the only spout cover to ever have won The National Parenting Center Seal of Approval.” Launch date: January 2007. — “The 4moms Digital Bath Spout Cover makes bathtime easier for parents and safer for children because of the benefits of its patent-pending TempAssure and CoverSafe Technologies,” Rob Reuter, vice president of marketing for 4moms, told TDmonthly. In Tongue Tanglers, players make tongue twisters for each other using 900 words on 450 cards. They have 10 seconds to say the tongue twister that an opponent devised, as many times as possible. This product is a 2008 iParenting Media Award winner. Launch date: August 15, 2007. Slap Wacky! is a fast and fun game where players rush to put together the most wacky shape patterns before the cards run out. Once a player completes a shape, he must slap it to get the points before another player blocks him. The player with the most points wins. The game is suitable for two to 10 players, and comes with 72 Shape Cards, six Wild Cards, and six Block Cards. This game received the Parents' Choice Fun Stuff Award. Trhyme Jr. - The Legend of the Book of Rhymes by L. M. RDEUX INNOVATIONS INC. In this rhyming word game, children are transported through the Land of Koob as they fly on a magical book, answer clues with words that rhyme, and test their fate along the way. Colliding imagination and adventure with word fun sparks curious minds. 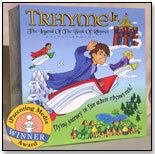 Trhyme Jr. is indeed a high-flying journey in fun where rhymes rule. Players may encounter a "Twist of Fate" that could either be lucky or yucky. “Trhyme Jr.’s unique rhyming challenge is a favorite of children, parents and teachers alike,” VP Linda Polaski of L. M. Rdeux Innovations told TDmonthly. This product received a Best Products iParenting Media Award for 2007. Launch date: November 2006.
bébéPOD plus by PRINCE LIONHEART INC. The bébéPOD plus captivates the interest of babies with its bright colors, fascinating toy, and the soft and squishy feel of a seat designed especially for them. Its ergonomic design provides optimal support in helping baby learn to sit, it helps ensure that baby is comfortable and secure, and it comes with a selection of fun and stylish placemats. Ideal for travel, the non-toxic product is easy to clean and has a removable pommel, adjustable tray and a custom-designed Sassy toy with toy bar. It is intended for babies ages three months to 14 months. This product is an iParenting Media Award winner. ― Prince Lionheart is one company that “accommodate[s] me no matter how 'little' I am,” Kathleen Fisher of Pink Belly Gifts told TDmonthly in spring 2007. Ms. Frizzle and her students take Young Scientists on a wild ride into the human body with these breathtaking experiments. Young Scientists bend bones, make joints, map taste buds, expand lungs, build a stethoscope, measure lung capacities and heart rates, perform the iodine starch test, spin glitter, simulate synovial fluid, create a human body poster, and much, much more. 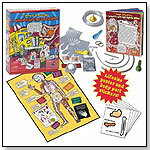 This exciting kit includes a life-size poster with 8 sheets of body part stickers. “This is a true hands-on learning experience in that children make everything themselves. … They are also building a life-size human poster [that] will be a dazzling addition to any child's room,” President Esther Novis of The Young Scientists Club told TDmonthly. This product received the National Parenting Center Seal of Approval and an iParenting Media Award, as well as a 2007 Parents' Choice Recommended Award. Launch date: January 1, 2007. Viewing products 1101—1110 out of 1181 products.